Nelson’s Blood sings rollicking roaring shanties. This band from Port Townsend features Mike and Val James, Chris Gilbert, Jim Scarantino, Annie Scarborough, Steve Blakeslee, and Jay Hagar who are fast becoming the old salts of the Salish Sea. 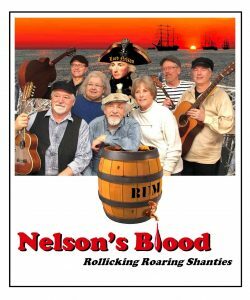 Born out of the long-running sea shanty circle in the Victorian seaport of Port Townsend, Washington, Nelson’s Blood celebrates in music the people and varied cultures who have braved the seas for treasure, commerce and adventure. The group performs these working songs for modern audiences without forgetting the role they played in lives harder than any of us can imagine. Like the crew of a great sailing ship, the band members hail from very different walks of life and regions of the globe. They have shared their music in Port Townsend pubs, the Northwest Maritime Center, schools and the city’s International Wooden Boat Festival, and are scheduled to perform at this year’s Northwest Folklife in May.